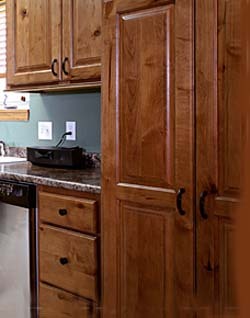 "Full-access" cabinetry is one of the many ways of designing and building cabinets. It is also sometimes called "frameless" or "European-style" cabinetry. It's different from the most-common American cabinetmaking norms, which employ an assembled face frame which attaches to the front of the cabinet box. The doors hinge to this frame, and either overlay it, or are inset flush within it. A cabinet face frame is normally constructed of 1-1/2" wide components, which, by their nature, restrict each cabinet opening somewhat. But full-access cabinetry is different. Full-access cabinets have no face frame. Doors attach directly to a sturdy box, allowing full unrestricted access to the cabinet interior. Thus the name: full-access.